This rectangular, five-sided box is a creation of the experienced Palekh artist, Vladimir Bogdanov. 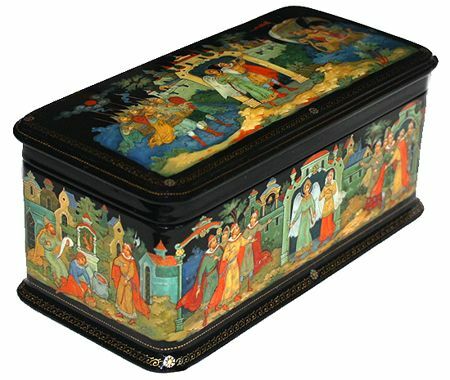 The box's lid and its four sides show some recognizable moments from Pushkin's "Tale of Tsar Saltan". The box's right side shows the episode when Tsar Saltan has chosen a wife, the youngest of three sisters. On the rear side of the box we can see the moment when a herald reads the tsar's order to seal Prince Gvidon and his mother into the barrel and throw the barrel into the sea. The box's lid depicts Prince Gvidon and his wife, Princess Swan, welcoming Tsar Saltan who arrives to the island on board of his ship. The island is defended by thirty-three Warriors of the Sea painted from the left of the central scene. The left side shows the magic squirrel that shells golden nuts. The box's front side shows Princess Swan and Prince Gvidon's mother meeting Tsar Saltan near the palace. Each of the scenes is well-done, in the traditional Palekh style. The drawing is quite fine, with small details in the characters' faces and costumes, some architecture and the landscape. The details are richly enhanced with gold and aluminum paint that adds a rich brightness to the work. Gold and aluminum paint is also used to decorate the box's exterior with beautiful patterns. The box is constructed out of high-grade paper-mache. The exterior of the piece is painted with black lacquer and interior is painted with red lacquer. The lid is hinged on top and the box stands on flat bottom. The work is signed with the artist's name, Palekh and the year of 2010.